WELCOME TO THE 2019 YEAR! 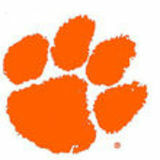 SINCE ITS FOUNDING IN 1934, IPTAY has been committed to supporting Clemson student-athletes. IPTAY provides funding for athletic scholarships, new and upgraded facilities and the Nieri Family Student-Athlete Enrichment Center. In addition, the one IPTAY enterprise oversees the management and oversight of all premium seating within our athletic venues, as well as the Block C Club. IPTAY is the largest revenue producer for Clemson athletics and also provides an academic endowment on campus to non-athlete students as well. Our 19-sport program relies heavily upon the support of more than 17,000 priority donors to the annual fund. At every level, each gift directly supports the success of our nearly 500 student-athletes. That success is evident as for the second straight year, Clemson set a new school record as seven programs were honored for outstanding academic achievement as part of the NCAA Academic Performance Public Recognition Awards. Baseball, men’s basketball, football, men’s cross country, women’s golf, rowing and volleyball each earned recognition, ranking in the top 10 percent of their sport in the eligibility, graduation and retention metric. Clemson is the only school in the nation to earn academic recognition in baseball, men’s basketball and football, and the only school in the ACC to be recognized for rowing. In addition, 230 student-athletes recorded a GPA above 3.0 during the fall 2017 semester. Accomplishments like this, both on and off the fields of competition, are a testament to the importance of continuing to invest in programs that directly impact the lives of nearly 500 studentathletes in our 19 sports. At IPTAY, our mission is to provide Clemson student-athletes with the total athletic and academic experience. I would like to thank our 17,076 donors who support IPTAY and make this possible. If you are not currently an IPTAY donor, I urge you to join IPTAY at whatever level you can and support the one IPTAY enterprise as we continue in this new era for IPTAY and Clemson athletics. On behalf of our staff, coaches and student-athletes, I would like to thank you for your generous support as we look forward to the upcoming year! CENTURY IPTAY provides millions of dollars in support for 19 varsity sports and various other programs that help enrich the lives of Clemson student-athletes. In the last 10 years, scholarship costs for student-athletes have risen by 77.5 percent! The IPTAY Scholarship expense amount also includes room and board, fees and other expenses to the University tuition costs, bringing the approximate total cost of attendance to $26,000 for in-state and $46,000 for out-of-state students. It is important to note that the IPTAY scholarship expense does vary annually due to several factors including the number of scholarships awarded, ratio of in-state verse out-of-state students, cost of attendance legislation. ONCE A TIGER, ALWAYS A TIGER. The Block C Club is composed of former student-athletes as well as coaches, equipment managers, athletic trainers, cheerleaders, mascots and special honorees of the Clemson University Athletic Department. This organization exists to provide fellowship among all letterwinners, to recognize and honor former student-athletes, to provide outreach to letterwinners in an effort to reconnect them with Clemson University and to educate current coaches and student-athletes about the history of Clemson athletics. The Block C Club, formerly known as the Tiger Letterwinners Association, also oversees the Clemson University Athletic Hall of Fame. WANT TO CONNECT? If you are a Clemson University letterwinner ready to reconnect, contact Block C Club Executive Director Bob Mahony (Baseball â&#x20AC;&#x2122;76) at MAHONYR@CLEMSON.EDU or 864-656-2974. Or contact Block C Club Assistant Director Travis Blanks (Football '15) at TBLANKS@CLEMSON.EDU or 864-656-9492. IPTAY has impacted my Clemson experience because it has allowed me to meet new people and build important relationships for my future. It means a lot to me because it shows how the University allows student-athletes to maximize their experience of being a Tiger! IPTAY provides an amazing experience for all student-athletes at Clemson! The new Nieri Center sets us up for success in the classroom, as well as providing a great fueling station for quick turnarounds. IPTAY really makes Clemson the full experience, and I could never imagine being anywhere else! I could not be more grateful for the support that IPTAY gives to me and all of the student-athletes at Clemson. It really lives up to the â&#x20AC;&#x153;Best is the Standard" motto at Clemson. The facilities that we have available on campus are more than we could ever ask for and improvements are always being made! JUNIOR // SPORTS COMM. // RICHMOND, VA.
As a 4-star recruit and top defensive national football prospect, one might assume Clelin Ferrell chose Clemson University for its winning program. And although he quickly became a crucial part of the program’s success, garnering All-America honors in 2017, he reflects that he chose Clemson for a much more meaningful reason. “I loved the people here and felt right at home on my first visit here. But even more than Clemson being the place I wanted to be, I felt that this was the place I needed to be.” Many of those programs and opportunities that Ferrell felt he needed were provided through financial support from IPTAY members. “IPTAY support has been huge. The programs IPTAY provides are so important to our opportunities. PAW Journey has been a big part of my experience here and it has helped me develop as a leader on and off the football field.” Ferrell recently took part in PAW Journey’s mission trip to Costa Rica, where the team built three houses and roads in areas devastated last fall by Tropical Storm Nate. In Costa Rica, nearly 400,000 people were left without running water and thousands are still sleeping in shelters. For Ferrell, “That trip was life changing. All the things we learn in the classroom and on the football field are important, but they don’t compare with experiences like that. PAW Journey is helping me become a man.” Although much of his life on campus is dedicated to training and studying, Ferrell also finds time to support other teams around Clemson. He can often be found cheering on his fellow Tigers in Littlejohn Coliseum and Doug Kingsmore Stadium. And even though Ferrell was part of a national championship winning football team, his greatest moment as a Clemson student-athlete might come as a surprise. His face lights up as he recalls, “The 2016 Louisville game in Death Valley. I have never heard that place so loud. The fans were amazing. And as a team, we fought so hard, and won against that year’s Heisman winning quarterback. That is the moment I knew we were good enough to win the national championship.” For Clelin Ferrell, Clemson and IPTAY are giving him everything he dreamed of in a college experience, and he does not doubt his decision to play for the Tigers. Whatever comes next for this well-rounded studentathlete, success is sure to be part of the equation. For Clemson football fans, student-athletes like Ferrell are the total package — a winner on and off the field, exactly what we want and need. SENIOR // ACCOUNTING // SAN DIEGO, CALIF. Honestly, IPTAY is what makes being a student-athlete at Clemson something special. IPTAY is the foundation of why we as student-athletes get experiences that will last for a lifetime. I have been fortunate to take part in the Tiger Leadership Academy which is supported by IPTAY. I cannot put into words how much I appreciate being a part of the Clemson Family, and if it wasn’t for IPTAY that wouldn’t be possible. Thank you IPTAY! IPTAY provides student-athletes with the opportunities of a lifetime. Anything we need is there and all of our facilities are top-notch. IPTAY is ‘ALL-IN’ for Clemson student-athletes. Even though we have the best athletic facilities that I’ve seen around the country, we are always striving for more, and to be better. All this is possible thanks to support from IPTAY. MILLER-KRASILNIKOV SENIOR // MARKETING // DELRAY BEACH, FLA. Ally Miller-Krasilnkov’s ambition and work ethnic make her a winner in the classroom and on the tennis court. The senior marketing major enjoys being challenged in both settings and is planning to continue her Clemson journey in graduate school next year. She will start her work toward her masters at Clemson next year during her fourth year of eligibility on the women’s tennis team. As her college playing career winds down, Ally reflects fondly on her first visit to the Clemson campus. “When I visited Clemson everything just felt like home. The campus is absolutely beautiful, and everyone is genuinely nice. The people on campus always look out for each other; my coaches as second parents and my teammates as sisters." For hardworking student-athletes like Ally, IPTAY’s services can make a huge difference. According to Ally, “IPTAY has made my Clemson experience unforgettable. You can tell that everyone in IPTAY really cares for us studentathletes and wants Clemson to have the best of the best. They make it possible for me to succeed on and off the court, and I am forever grateful. One day, I want to be able to give back to this great university because I have received so much." In her rare downtime, Ally enjoys spending time with friends on Lake Hartwell. And in the close-knit student-athlete community, there is no shortage of great friends. Ally explains, “The great thing about the Clemson student-athlete culture is that everyone knows everyone! It is really tough to single out a favorite person when I’ve been able to meet and know so many amazing people." In the classroom, the choice is a little easier. For Ally, “Dr. Delancy Bennett is the only teacher I’ve experienced for two classes, Sports Marketing & Strategic Market Management. I’m so lucky because he is the BEST! Funniest professor I know who always gives you real-life experiences in challenging, fun assignments. He wants everyone in his class to succeed not only during college, but after as well." Ally Miller-Krasilnikov has left little doubt that she is achieving both those goals. There is also little doubt that financial support from IPTAY has helped her succeed. “IPTAY’s financial support is unmatched. We are able to get everything we need and more! We have top of the line nutritionists, food stations, strength and conditioning coaches and facilities, programs like SAAC and Tiger Leadership Academy and unbelievable academic support. Other colleges don’t even compare in my mind. I know we have the best." Without IPTAY, none of us would be able to do the things we do. They have given us an unbelievable opportunity and provided us with all of the tools we need to succeed. This support is a huge benefit for student-athletes. JUNIOR // PSYCHOLOGY & MINOR IN SPORTS COMM. // GREER, SC. I am truly grateful for IPTAY and their support. Without IPTAY, I would not have access to Jervey, where we train three times a week. Having healthy food options easily accessible in the tutoring center between classes, weights, and tutoring have also been a huge help to me. ON THE MAP 2018-19 CLEMSON STUDENT-ATHLETES HAIL FROM ACROSS THE COUNTRY AND AROUND THE GLOBE. WAYS TO GIVE: GIVING OPTIONS IPTAY ANNUAL IPTAY annual members are the rock-solid foundation that has served the University for more than 80 years. Every year, nearly 500 Clemson student-athletes â&#x20AC;&#x201D; and a number of non-athletes â&#x20AC;&#x201D; benefit from scholarships provided by IPTAY. These funds also make academic enrichment and life-skills training available for student-athletes and cover annual operating expenses and discretionary initiatives such as capital projects. IPTAY MAJOR GIFTS Clemson depends on the generosity and foresight of donors to build and maintain collegiate athletic excellence. Gifts that build an endowment and support major facilities and large-scale initiatives leave a lasting legacy and are vital to the future and the quality of athletics at the University. Major gifts may be in the form of cash, real estate, securities, gifts-in-kind and any number of other options. IPTAY GIFT PLANNING Planned gifts are a means of ensuring that the priorities of IPTAY continue for years to come. These visionary gifts ensure that opportunities exist for future generations of student-athletes through bequests, life insurance, charitable gift annuities, charitable lead trusts, charitable remainder trusts and a number of other instruments that continue long into the future. *SCHEDULED DRAFTS Paying your IPTAY pledge has never been easier. Have a portion of your IPTAY pledge deducted monthly from your credit card or debit card and forget check writing and stamps. The IPTAY fiscal year is July 1 through June 30. The draft will begin July 1 and will continue on the 1st of each month through June 1 of the next year to complete your pledge by the deadline. If you are interested in learning more about scheduled monthly payments or would like to set up a monthly draft, please contact Robin Lay in the IPTAY business office at 864-656-2977. Corporate Matching Gift programs may extend the impact of your gift through funds provided by your employer through your company’s matching gift program. A company match is included in your cumulative giving, which may move your membership to higher levels or increase your capital contribution. most convenient for you, please call 1-800-CLEMSON or 864-656-2115, email us at IPTAY@CLEMSON.EDU or drop by the IPTAY office at 1 Avenue of Champions at Centennial Boulevard (at Gate 9 of Memorial Stadium). Hours are Monday through Friday, 8:00 a.m. until 4:30 p.m.
BLOCK C CLUB Your investment ensures the continued tradition of excellence in athletics and academics for current and future student-athletes. At every level, Block C Club members receive networking opportunities at special events and exclusive benefits that keep former Clemson student-athletes involved with Clemson athletics. Annual members have provided vital support to Clemson since IPTAY’s inception. This loyal support is vital for scholarships for studentathletes, the operation of The Nieri Family Student Athlete Enrichment Center and its student-athlete academic enrichment programs, facility funding and IPTAY operations. OF IPTAY MEMBERSHIP At every level, IPTAY members receive benefits with their membership that keep them involved with Clemson athletics. The IPTAY Priority Points rewards system was developed in an effort to reward gift amounts and long-term support in the distribution of tickets, seating and parking. Priority Points are also used for tickets to bowl games, the ACC basketball tournament and all road games. IPTAY Priority Points are determined by a formula that utilizes both loyalty and contribution levels as shown in the chart below. PRIORITY POINTS SYSTEM The IPTAY Priority Points rewards system is another way of rewarding the loyalty of IPTAY members. Developed in an effort to reward gift amounts and long-term support in the distribution of tickets, seating and parking, Priority Points are also used for tickets to bowl games, the ACC basketball tournament and all road games. IPTAY Priority Points are determined by a formula that utilizes both loyalty and contribution levels as shown in the chart below. In 2008, Clemson joined the other top-20 FBS football attendance leaders in adding a preferred seating component to its annual giving program. Under the plan, season ticket holders who give at or above the specified per-seat values qualify for specific seating in Memorial Stadium. The initiative has enhanced annual support for student-athletes at Clemson and has given our athletic programs the resources they need to compete at the highest level, both in the classroom and in athletic competition. All season tickets in Memorial Stadium available for purchase require a per-seat donation. Minimum per-seat donations for specific seating in Memorial Stadium can be seen in the adjacent map. These donor requirements have been determined and endorsed by the IPTAY Board of Directors and the Athletic Department. SEAT EQUITY PLAN EQUATION: IPTAY SEAT VALUE X NUMBER OF SEATS = REQUIRED IPTAY DONATION As a reminder, the maximum number of season tickets an IPTAY Donor is eligible to purchase each season is determined by your IPTAY annual giving level. Please refer to the IPTAY benefits chart for exact quantities. When the initial IPTAY Seat Equity Plan was announced and implemented in 2008 and modified in 2013, one component of the plan permitted periodic marketplace review of the values of each section of seating in Memorial Stadium. The diagram to the right shows the current per-seat donations implemented during the IPTAY 2017 year. FREQUENTLY ASKED QUESTIONS Q: HOW DOES THE PLAN AFFECT LIFE AND ENDOWMENT DONORS? Q: WHY IS THE SEAT EQUITY PLAN IMPORTANT? As was done in 2008 and 2013, the modification of the IPTAY Seat Equity Plan will allow life donors to purchase the number of seats outlined in their respective life donor agreements as it pertains to the specific IPTAY giving level. These seats in the life donor agreement will not be affected. However, seats purchased above and beyond the life donor agreed upon number (included in the agreement) will be impacted by the modification of the IPTAY Seat Equity Plan, similar to the 2008 and 2013 IPTAY Seat Equity Plans. The preferred seating component within IPTAY is a vital part of the IPTAY Annual Fund. The funds generated by the IPTAY Seat Equity Plan go directly to supporting our student-athletes by way of athletic scholarships, new and upgraded facilities and student-athlete academic support services. These dollars continue to be critical in IPTAY’s efforts to provide the necessary resources to all student-athletes to be top competitors in the classroom and in athletic competition amidst the rising costs associated with intercollegiate athletics. Q: HOW DOES THE PLAN AFFECT CLEMSON FACULTY AND STAFF MEMBERS? Q: WILL THE IPTAY SEAT EQUITY PLAN BE REQUIRED BEYOND 2019? A faculty/staff member will have the same opportunity to maintain current seats as an IPTAY donor. 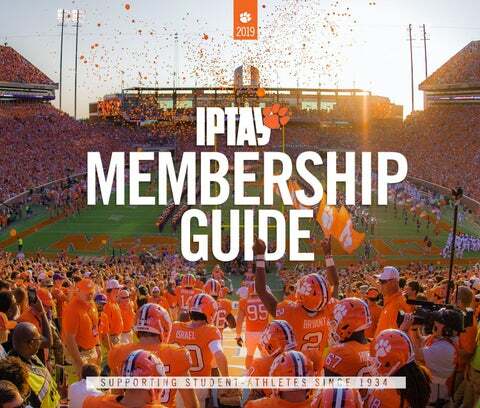 Continuing from the 2013 IPTAY Seat Equity Plan, a current Clemson faculty/staff member who purchases season tickets will receive a $160 credit toward an IPTAY membership, which may be applied to the modification of the IPTAY Seat Equity Plan. If the faculty/staff member already maintains an IPTAY donor level, $160 will be credited/added to his/her current donor level. Yes. The IPTAY Seat Equity Plan works in conjunction with your annual IPTAY contribution and will be necessary for your season ticket renewal each year. Also, the donation levels and seat values associated with each specific section may be revised to address the future needs of IPTAY and the Clemson University Athletic Department. The IPTAY Board and the athletic department will review the IPTAY Seat Equity Plan each year. Q: DOES THE PLAN MEAN THAT EVERYONE IN YOUR SECTION PAYS THE SAME AMOUNT OF MONEY? Q: DO I HAVE TO PARTICIPATE IN THE ANNUAL IPTAY SEAT EQUITY PLAN TO KEEP MY SEASON-TICKET LOCATION? A misconception when we use the term “equity” is that each IPTAY donor sitting next to another IPTAY donor is donating the same amount as the other. This is true in some cases, but there are many other factors that contribute to this not being exact. Obviously, the quantity of tickets is the main factor, as well as the parking the donors request for their IPTAY annual donation. The per-seat donation that IPTAY requires members to contribute is the minimum donors can contribute to renew their seats. Many IPTAY donors contribute more than the required donation. However, one must consider all of the factors, including parking priority, seat locations and most critically, that each donation is supporting the mission of IPTAY­—supporting Clemson student-athletes through scholarships, facilities and academic support. Yes. The IPTAY Seat Equity Plan is a requirement for renewal of season tickets in these identified priority locations. Please note all seating areas within Memorial Stadium now have an associated per-seat value. Q: HOW WILL THIS AFFECT MY PARKING ASSIGNMENT? Parking is reassigned on an annual basis using each donor’s annual giving level and priority point total. As donors make a decision to increase their giving to retain seats or to request seat improvements, parking assignments may be affected. Q: CAN I USE MY EMPLOYER’S MATCHING GIFT PROGRAM TOWARD MY CONTRIBUTIONS FOR THE IPTAY SEAT EQUITY PLAN? Yes. If your employer will match a gift to an athletic program, you can use these funds to fulfill the IPTAY Seat Equity Plan contribution. The matching contribution will only be credited to your account when the funds are received by IPTAY. Away-game tickets are allocated based on IPTAY Priority Points. For some away games, a Priority Point cutoff, as well as ticket limits, may be put in place to give as many IPTAY donors as possible the opportunity to purchase tickets. In the event that the number of orders received for an away game exceeds the available allotment, a Priority Point cutoff will be established, and those who do not meet the point requirement will be notified and refunded the purchase price. PAYMENT METHODS The Clemson Athletic Ticket Office accepts payment by VISA, MasterCard, Discover, American Express, cash and check. Please make checks payable to CUAD. S eneca Creek Rd . Sil Sil as as N. N. Pe Pe ar ar ma ma nB nB lvd lvd . .
Pe Pe rim rim ete ete rR rR d. d.
Pe rim ete rR d.
Sila sN .P ea rm an Blv d.
Sila Sila sN sN .P .P ea ea rm rm an an Blv Blv d. d.
The North and South Suites at Clemson’s Death Valley allow you to experience the luxurious side of Clemson football. Your suite package is complete with VIP parking privileges, access to the suite before and after the game, theater-style padded seating and HD TVs. The suites also feature retractable windows. So after you’ve retrieved your favorite beverage from your personal refrigerator, you’ll be ready to experience the thrill of “the most exciting 25 seconds in college football” and join the crowd in cheering our Tigers to victory! HOW TO QUALIFY Currently all Memorial Stadium North and South Suites have been sold for the 2018 football season. To qualify and be added to the waitlist for the suites at Death Valley one will be asked to sign a capital gift pledge form. In addition to being at the IPTAY ($3,200) Annual Fund level or above. This pledge is payable over five years and will contribute to your IPTAY Priority Points. For a pledge form, please contact Kyle Shields, Director of Premium Seating, at krshiel@clemson.edu or 864-656-3945. Choosing premium seating at Clemson University is a great way for you to take a leadership role in supporting our student-athletes, while receiving some of the best seats in one of our athletic venues! The Younts South Club and WestZone Club seats allow you to experience Clemson football the way it should be: outdoors, hearing the crowd roar, the band play and the cannon fire. Retreat to the club lounge when necessary, for the climate control, private restrooms, food and beverage, HD TVs or to access your personal beverage locker. HOW TO QUALIFY Currently all seats in the Younts South Club and WestZone Club have been sold for the 2018 football season. To qualify and be added to the waitlist for the Younts South Club or the WestZone Club, one will be asked to sign a capital gift pledge form for the minimum of $25,000 per pair. In addition to being at the IPTAY ($3,200) Annual Fund level or above. This pledge is payable over five years and will contribute to your IPTAY Priority Points. For a pledge form, please contact Kyle Shields, Director of Premium Seating, at krshiel@clemson. edu or 864-656-3945. The Coliseum Club seats allow you to experience Clemson Tiger basketball with ultimate comfort and amenities while still being right in the middle of the action! Hear the sounds of the players on the hardwood and the band as they strike up Tiger Rag after a high-flying dunk. Retreat to the club lounge when necessary, for private restrooms, food and beverage, HD TVs and a break from the exciting ACC action. Everyone who would like to be considered for the Coliseum Club will be asked to sign a capital gift pledge form for the minimum of $25,000 per pair. In addition to being at the IPTAY ($3,200) Annual Fund level or above. This pledge is payable over five years and will contribute to your IPTAY Priority Points. For a pledge form, please contact Kyle Shields, Director of Premium Seating, at krshiel@clemson.edu or 864-656-3945. Since 1970, Clemson baseball players have showcased their talents in Doug Kingsmore Stadium. Now you can be part of a tradition of success and watch the Tigers play ball from the Field-Level Seats only feet away from the action at home plate. Enjoy one of the finest spectator experiences in college baseball from your chairback seat that comes with more space and enhanced amenities. Currently all Doug Kingsmore Stadium Field-Level Seats have been sold for the 2019 baseball season. To qualify and be considered for the Field-Level Seats and be added to the waitlist, you will be asked to sign a capital gift pledge form for a minimum of $10,000 per pair. In addition to being at the IPTAY ($3,200) Annual Fund level or above. This pledge is payable over five years and will contribute to your IPTAY Priority Points. For a pledge form, please contact Kyle Shields, Director of Premium Seating, at krshiel@clemson.edu or 864-656-3945. EXPERIENCE THE ENERGY AND EXCITEMENT OF LITTLEJOHN COLISEUM! Innovations include an enormous scoreboard featuring a total of six screens, 17 ribbon board displays that cover most of the circumference of the arena, and more than 100 television screens inside Littlejohn, with a new sound system that will be heard throughout the concourse. The Atlantic Coast Conference Menâ&#x20AC;&#x2122;s Basketball Tournament will be played in Charlotte's Spectrum Center March 12-16, 2019. IPTAY members who are basketball season ticket holders will receive the tournament application in January. Basketball tournament tickets are assigned based on IPTAY priority points. FOR MORE INFORMATION, VISIT CLEMSONTIGERS.COM OR CALL 1-800-CLEMSON. IPTAY IS YOUNG AT HEART Loyal Tiger fans of all ages can be a part of supporting student-athletes at a level that is affordable and keeps them in the middle of the action. Once a Tiger, always a Tiger. And IPTAY wants to help recent alums continue to be a part of Clemson after graduation. IPTAY YA! (Young Alumni) is a very affordable way to stay connected, enjoy all the benefits and save with incredible discounts. To join IPTAY YA!, go by the IPTAY office Monday through Friday, 8 a.m. to 4:30 p.m.; call 1-800-CLEMSON; or go online to ClemsonTigers.com/IPTAY. IPTAY DONOR DISCOUNT *Applies to all levels up to the Tiger level. To join at a level higher than the Tiger level, you will receive the credit that a Tiger-level donor receives based on your graduation date. For example, if a May 2019 graduate wants to join at the Jervey level, which is $4,600, they would receive a credit of $1,440 off the $4,600 donation. For questions or more information, please contact Lindsey Leonard at (864)-656-2975 or lsweval@clemson.edu. COLLEGIATE CLUB Some of the most memorable moments of college are those shared with other Tigers — many at a Clemson athletic event. The IPTAY Collegiate Club is the student group within IPTAY that works to make sure every Clemson team has a loyal fan base at every home game and the support they need to succeed. Since it began in 1997, the IPTAY Collegiate Club now has more than 8,000 members. With a low yearly membership donation and loads of benefits (like priority in student football ticket distribution and discounts around town), IPTAY Collegiate Club helps current students be right in the middle of the action. IPTAY REPRESENTATIVES IPTAY has great success because of a dedicated network of volunteers who serve Clemson athletics across the country as the IPTAY Representative Program (REP). This group of nearly 480 men and women work within the regions where they live to encourage Clemson alumni and friends to join IPTAY and support the student-athletes who rely on this support. They actively recruit new leadership gifts and create a link between Clemson and its constituents. IN RETURN FOR THEIR VITAL ROLE IN IPTAY SUCCESS, REPS RECEIVE:  Invitations to REP-only events  Rewards for helping meet IPTAY annual goals  REP Incentive Points based on the contributions of the donors assigned to them that can be used to purchase exclusive Clemson items as a reward for their loyalty. — Each renewal dollar = 1 point — Each upgrade dollar = 2 points — Each new dollar donated = 3 points  REPs who signup multiple new donors are eligible for rewards such as on-field recognition. � President � President-Elect � Secretary � Treasurer THE CHIEF EXECUTIVE OFFICER OF IPTAY The chief executive officer of IPTAY is a Clemson employee, responsible for the general management and fundraising programs, as well as the implementation of board-enacted policies, and reports to the IPTAY Board of Directors and to the president of the University. CEO OF IPTAY AND ATHLETIC DIRECTOR In order to conduct fundraising activities, the CEO of IPTAY and athletic director (AD) work closely together, with the AD communicating with the IPTAY board and CEO concerning long- and short-term plans for the athletic department in order that those plans may be successfully completed. IPTAY AND THE ATHLETIC TICKET OFFICE IPTAY is responsible for the seat equity plan (per-seat donation) as well as the Priority Points system. The director of ticket operations and staff report to the athletic department, are housed in the IPTAY Center and work closely with IPTAY in administering both programs. FREQUENTLY ASKED QUESTIONS Q: CAN I TRANSFER MY MEMBERSHIP? IPTAY memberships cannot be transferred to another person. IPTAY memberships can only be passed to a spouse. Life Memberships are no longer available. Q: HOW CAN I START A COMPANY MEMBERSHIP? All new company memberships are required to be donors at the McFadden level ($6,000) or above. Annually, each company membership will be required to submit to the IPTAY office a certificate of good standing and a tax identification number or similar proof of company status. Q: HOW MANY IPTAY MEMBERS ARE THERE? As of July 1, 2018, there are 17,076 IPTAY donors. The Collegiate Club has more than 8,000 members and the Tiger Cub Club and IPTAY CATS have more than 2,100 members. Q: WHAT IS THE RELATIONSHIP BETWEEN CLEMSON ATHLETICS AND IPTAY? IPTAY is a non-profit entity with a volunteer board of directors that works with the Clemson University Department of Athletics to serve its mission by raising private funds and providing necessary resources to achieve success. Q: HOW LONG HAS IPTAY BEEN AROUND? IPTAY is widely regarded as the father of athletic fundraising. The IPTAY scholarship fund traces its roots to the 1930s. Dr. Rupert Fike is credited with being the originator of IPTAY, but the seed that Dr. Fike needed for his now muchenvied group was planted there by then-Head Football Coach Jess Neely. Q: WHO CAN JOIN IPTAY? All Clemson fans of any age! You do not have to be a former student-athlete or alum of Clemson University. IMPORTANT DATES: JULY 1 IPTAY fiscal year begins. SEPT 1-2 First Friday and home football season kickoff. FEB. 15 50% of your IPTAY pledge is due in order to receive a football season ticket application. MARCH - APRIL Season ticket applications available online. JUNE 1 All pledges for the current fundraising year are due. JUNE 30 The end of the fiscal year for IPTAY. All applications received after this date will be applied to the next fiscal year. If you have any questions about IPTAY or would like to learn more about how IPTAY supports Clemson student-athletes, please visit: ClemsonTigers.com/IPTAY or contact us at iptay@clemson.edu or 1-800-CLEMSON. THE FUTURE OF IPTAY IS YOU! Just as it was envisioned by Rupert Fike in 1934, IPTAY is about a loyal fan base of supporters at all levels. Gifts of all sizes, from those of Tiger Cubs to multimillion-dollar leadership gifts, serve to support studentathletes. Without IPTAY support, you might not be sitting in a state-of-the-art stadium, surrounded by other fans in solid orange, cheering on a strong team of Tigers. And across campus, student-athletes in 18 other sports would not be able to take to the field, arena or water proudly wearing the Tiger Paw. COMPLIANCE: ASK BEFORE YOU ACT Clemson University continues to have great successes on and off the playing field thanks to your support of Clemson Athletics. However, in order to represent the University in the most positive manner, coaches, staff, student-athletes, alumni, IPTAY members and fans must adhere to the rules and regulations of the NCAA, the ACC and the University. The NCAA requires each member institution to have “institutional control” and to operate its intercollegiate athletics programs in compliance with NCAA rules and regulations. This means that Clemson University is responsible for your actions. Violations of NCAA rules, regardless of your intentions, can jeopardize a student-athlete’s opportunity to attend and compete for Clemson University. Violations also result in severe penalties for the University and the individual booster involved. If you have any questions or believe you have seen a violation of an NCAA rule, please contact Compliance Services at 864-656-1580 or compliance-L@clemson.edu.